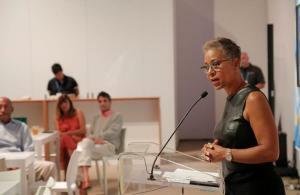 Greater Fort Lauderdale, Fla. (September 25, 2018) – Philanthropists, professional tennis elite and community leaders gathered during a private reception at the 2018 U.S. Open to raise awareness and support for the ATA/ATEF (American Tennis Association/American Tennis & Education Foundation) National Tennis Center coming to Greater Fort Lauderdale’s Miramar Regional Park. The event, hosted by the Greater Fort Lauderdale Convention & Visitors Bureau, included addresses from Katrina Adams, Chairman of the Board and President of the United States Tennis Association, and Stacy Ritter, CEO and President, Greater Fort Lauderdale Convention & Visitors Bureau. The ATA/ATEF National Tennis Center, expected to be tournament-ready by 2020, is anticipated to bring immediate economic benefit to the community through conferences, training and travel. (left to right) Katrina Adams, Chairman of the Board and President of the United States Tennis Association with Stacy Ritter, President & CEO for Greater Fort Lauderdale Convention & Visitors Bureau, on August 31 in Queens, New York, at 2018 U.S. Open event supporting ATA/ATEF National Tennis Center coming to Greater Fort Lauderdale/Broward County. Katrina Adams, Chairman of the Board and President of the United States Tennis Association, addressing guests at the 2018 U.S. Open in support of the ATA/ATEF National Tennis Center to Greater Fort Lauderdale/Broward County. 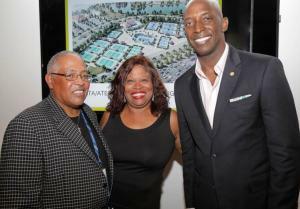 (left to right) Albert Tucker, VP of Multicultural Business Development for Greater Fort Lauderdale Convention & Visitors Bureau; Roxanne Aaron, American Tennis Association President-Elect; Wayne Messam, City of Miramar Mayor, gather in front of a rendering of the ATA/ATEF National Tennis Training Complex coming to Miramar Regional Park.